This image from the panoramic camera on the Mars Exploration Rover Spirit shows scoriaceous rocks (rocks containing holes or cavities) on the ground, as well as a transition from rocky terrain (foreground) to smoother terrain (background). Spirit is heading toward the smoother terrain on its way to the "Columbia Hills." The holes in some of the rocks may have resulted from "blisters" formed by water vapor as it escaped lava. This indicates that the rocks were chilled atop an ancient lava flow. Porous rocks such as these, now appearing in abundance, have not been seen since early in the mission. 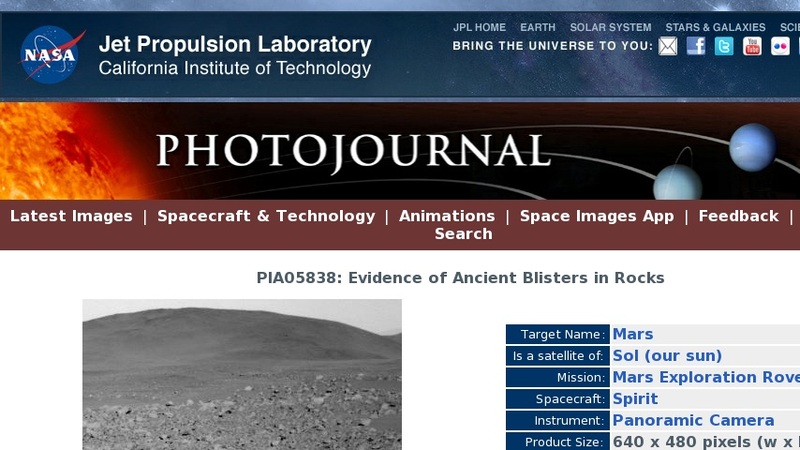 Scientists believe they may have been covered by crater ejecta. This image was taken on sol 110 (April 24, 2004) at a region dubbed "site 35. "